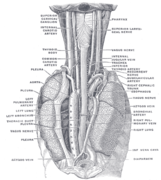 In human anatomy, the thoracic duct is the larger of the two lymph ducts of the lymphatic system. It is also known as the left lymphatic duct, alimentary duct, chyliferous duct, and Van Hoorne's canal. The other duct is the right lymphatic duct. The thoracic duct carries chyle, a liquid containing both lymph and emulsified fats, rather than pure lymph. Thus when it ruptures, the resulting flood of liquid into the pleural cavity is known as chylothorax. In adults, the thoracic duct is typically 38–45 cm in length and has an average diameter of about 5 mm. The vessel usually starts from the level of the twelfth thoracic vertebrae (T12) and extends to the root of the neck. It drains into the systemic (blood) circulation at the angle of the left subclavian and internal jugular veins as a single trunk, at the commencement of the brachiocephalic vein. It also collects most of the lymph in the body other than from the right thorax, arm, head, and neck which are drained by the right lymphatic duct. The thoracic duct originates in the abdomen from the confluence of the right and left lumbar trunks and the intestinal trunk, forming a significant pathway upward called the cisterna chyli. It traverses the diaphragm at the aortic aperture and ascends the superior and posterior mediastinum between the descending thoracic aorta (to its left) and the azygos vein (to its right). The duct extends vertically in the chest and curves posteriorly to the left carotid artery and left internal jugular vein at the T5 vertebral level it drains into the systemic (blood) circulation at the venous angle of the left subclavian and internal jugular veins as a single trunk, at the commencement of the brachiocephalic vein, below the clavicle, near the shoulders. The lymph transport, in the thoracic duct, is mainly caused by the action of breathing, aided by the duct's smooth muscle and by internal valves which prevent the lymph from flowing back down again. There are also two valves at the junction of the duct with the left subclavian vein, to prevent the flow of venous blood into the duct. In adults, the thoracic duct transports up to 4 L of lymph per day. The first sign of a malignancy, especially an intra-abdominal one, may be an enlarged Virchow's node, a lymph node in the left supraclavicular area, in the vicinity where the thoracic duct empties into the left brachiocephalic vein, right between where the left subclavian vein and left internal jugular join (i.e., the left Pirogoff angle). When the thoracic duct is blocked or damaged a large amount of lymph can quickly accumulate in the pleural cavity, this situation is called chylothorax. Deep lymph nodes and vessels of the thorax and abdomen (diagrammatic). Front photo of the Ductus Thoracicus in the Human mediastinum with the heart and part of the pericard removed. ^ a b Knipe, Henry. "Thoracic duct | Radiology Reference Article | Radiopaedia.org". radiopaedia.org. Retrieved 8 October 2016. ^ a b Insull, Phillip (1 October 2007). "CLINICAL ANATOMY: APPLIED ANATOMY FOR STUDENTS AND JUNIOR DOCTORS. 11th EDITION - BY HAROLD ELLIS". ANZ Journal of Surgery. 77 (10): 911–912. doi:10.1111/j.1445-2197.2007.04191.x. ISSN 1445-2197. ^ Michael Schuenke; Erik Schulte; Udo Schumacher; Lawrence M. Ross; Edward D. Lamperti; Markus Voll; Karl Wesker (24 May 2006). Thieme atlas of anatomy: Neck and internal organs. Thieme. pp. 136–. ISBN 978-3-13-142111-1. Retrieved 1 June 2010. ^ Tewfik, Ted L; Mosenifar, Zab (7 December 2017). "Thoracic Duct Anatomy". Medscape. WebMD Health Professional Network. Anatomy figure: 21:05-02 at Human Anatomy Online, SUNY Downstate Medical Center—"The thoracic duct and azygos venous network"
This page was last edited on 19 March 2019, at 22:54 (UTC).